Last year a review of the A&E centres by NHS England suggested that a two tier system should be introduced to try and remove some of the pressure from the A&E departments. However, is this really enough to help? I was interested to read in a recent study carried out by the College of Emergency Medicine that, although NHS England has suggested that 25% of patients who arrive in A&E departments could have been treated in the community, it appears that of more than 3,000, in fact, only 15% could have been treated in this way. This difference between the figures amounts to 1.4 million patients. With this discrepancy becoming so apparent, is it wrong to suggest that a large number of A&E visits could be reduced by the introduction of a two tier system and, if so, what else could be done to relieve the pressure and problems with treatment in accident and emergency departments? What is the two tier system? The idea of the two tier system is that A&E departments would no longer be expected to do everything when it comes to urgent care. Instead, to avoid inconsistencies in treatment, it has been suggested that some hospitals should focus their resources on the most serious cases such as heart attacks and strokes whilst others could focus on other types of injury. By doing this it was hoped that pressure in each hospital would be reduced and, members of the public would come to realise that not all hospitals are equipped to provide the same level of care for all ailments. It has been suggested that perhaps GPs could be located in or alongside A&E units as this would help to prioritise cases that require emergency assistance. The review found that of 12 A&E units assessed over a 24 hour period in March, 85% of patients attending needed to be seen in A&E although, of these, 22% could have been seen and treated by a GP on site if one had been available. 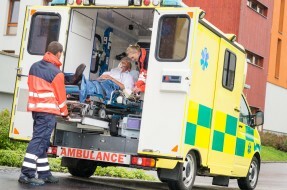 As well as placing GP surgeries in or alongside A&E departments it may be that the public should be offered greater self care advice or that the NHS 111 number and ambulance staff could offer more skilled treatment at the scene. We are constantly being told that we should not be abusing A&E departments and wasting NHS resources but, as can be clearly seen from the latest statistics, the majority of patients who attend A&E departments are genuinely ill and require urgent medical care. There is therefore a balance that needs to be struck between reducing pressure on A&E departments and also ensuring that patients who actually need emergency treatment do receive it and promptly. Whilst it may be that between 10 and 45% of those who attend A&E departments could be seen and treated by a GP, perhaps on site or provided with further advice or assistance from paramedics or telephone advisors, it is clear that further consideration needs to be given as to how waiting times can be cut and NHS resources better deployed. As clinical negligence solicitors, we all too often see what can happen when a patient is not seen in an A&E department as soon as they need to be, or if their consultation is rushed and therefore important symptoms are overlooked and therefore we fully support the need to reduce waiting times and ensure patients receive the care required every time. If you or your family member have suffered injury as a result of negligence in an A&E department then please contact us for further advice.